Spotify just found out there’s such a thing as too much Drake. 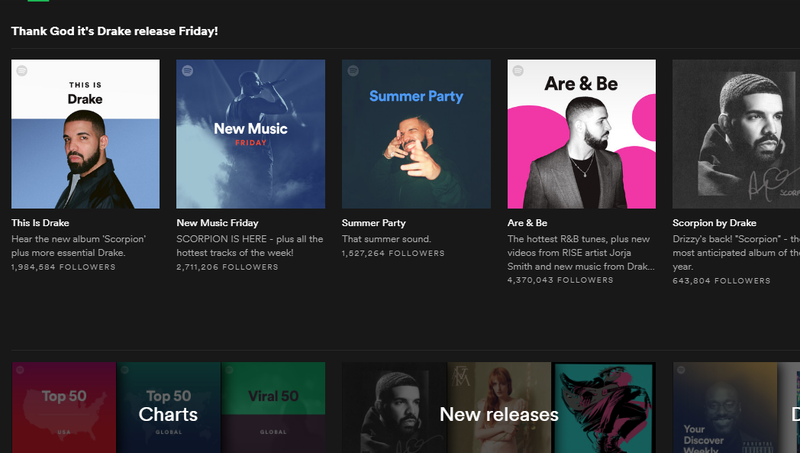 This weekend, Spotify users were bombarded with the stern visage of Aubrey “Drake” Graham as part of a promotional deal, known as “ScorpionSZN,” meant to promote the artist’s latest album, Scorpion. While Drake is definitely a household name, that doesn’t mean everyone on Spotify was happy about the artist taking over the streaming platform, especially when some Spotify-created playlists that featured Drake’s photo were in fact devoid of the titular artist. Spotify: hey, we make playlists catered to your unique tastes. Spotify user: listens to 18 hours of Mongolian throat singing, Icelandic drumming bands and a peruvian death metal band. The Drake spam so annoyed some users that they began demanding Spotify refund their payment for the month. (A Spotify customer service person told Gizmodo they don’t offer refunds because they’re annoyed about Drake.) Regardless, it’s clear that saturating the streaming service with a single artist’s mug is a good way to spark avoidable outrage. Spotify’s deal with Drake is somewhat puzzling, considering Drake’s reported $19 million (£14.5 million) contract with Apple Music. Whether the artist is on good terms with the streaming company is up for debate after Drake’s reference to Apple Music executive Larry Jackson in his remix of Jay Z’s “Family Feud” track, on which Drake ripped on Jackson for ostensibly giving him a bum deal. Spotify did not immediately respond to our request for comment about the Drake deal and the uproar it caused. But the company did tweet about the artist’s album on Saturday, stating it was streaming at a rate of 10 million times per hour.